– “The Future’s So Bright, I Gotta Wear Shades”, originally sung by Timbuk3 from their debut album “Greetings from Timbuk3”, Released in 1986. This piece of Boomercup fanart, which is part of BrickercupMasterX3’s Boomercup Month, is dedicated to Marisa aka Absolhunter251, Lunaria aka Luna-rii, Sano aka Sano-BR, and Shannen Ngo aka SmoothCriminalGirl16 who are celebrating their birthdays today. So, Marisa, Lunaria, Sano, Shannen, I wish you a lot of love, joy, beauty, prosperity, happiness, and immense abundance in your lives as artists and as people and I wish you all such marvelous birthdays. Moreover, I dedicate this to all of the Boomercup shippers out there. With that said, I hope you enjoy this piece of Boomercup fanart and soak up its goodness. 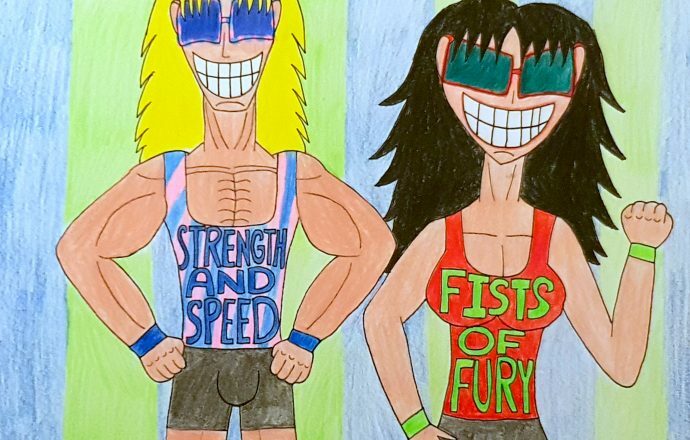 Here we have Boomer and Buttercup who are fresh out of their workout routine and they look absolutely stunning with their sleeveless shirts and short shorts, thus making them quite a formidable duo consisting of a lovable dumb muscle and a fiery brawler. 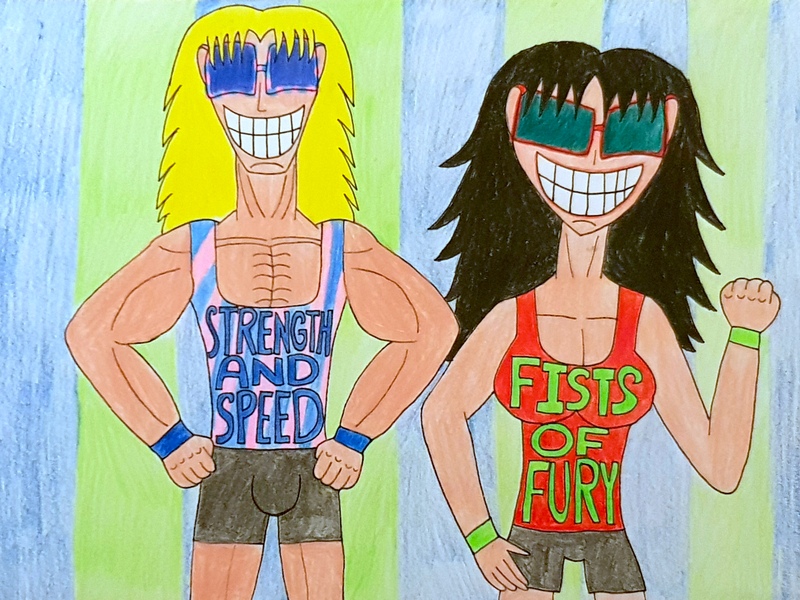 While I have always kept Boomercup as my cute, innocent pairing for life, I want you to take a good, close look at the shirt colors and the sunglasses frames in terms of who I ship Boomer and Buttercup as my OTPs for life and those who ended up having such lovely children from their respective spouses. Don’t be shy, as I know this will be fun, especially when you type it down on the comments below. For this Boomercup submission, I have grown up on the classic song “The Future’s so Bright, I Gotta Wear Shades” when I caught this as the ending credits to Disney’s “An Extremely Goofy Movie” as an eight-year-old boy traveling to San Francisco alongside my mother and younger sister staying at a relative’s place. The version I caught was sung by Pat Benatar, but I was pleasantly surprised to know that the original version was sung by Timbuk3. I listened to both versions and I have to say that I found myself leaning towards the Pat Benatar version more mostly because of nostalgia and the overall feel of this particular rendition. So, I hope you also enjoy both of these versions, as you gaze into the loveliness that is Boomercup. Well, I hope you all enjoyed this and I will see you all in the next submission. Take care!